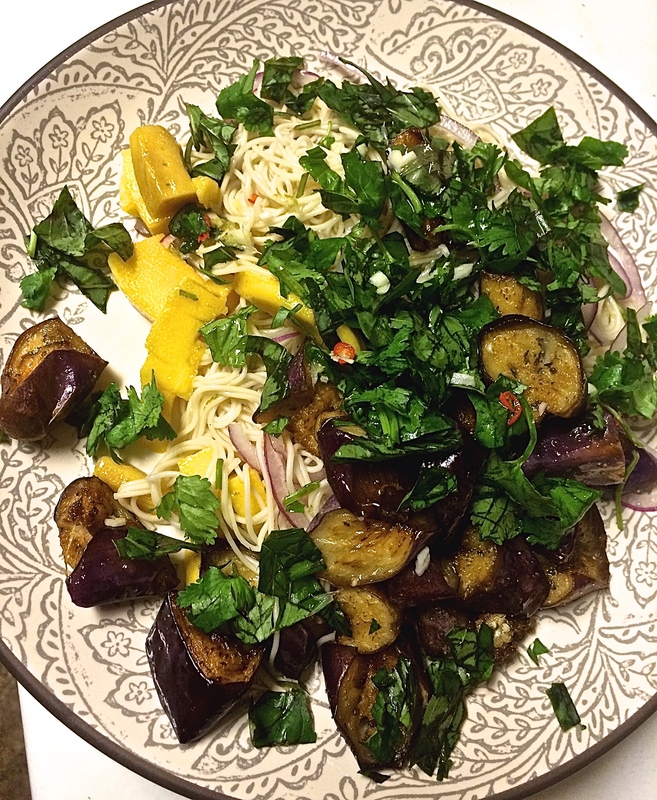 Soba Noodle Salad – One Half Indian. The past two weeks have been busy at work (I teach 10th and 12th grade English), and I have been sick. My sweet husband has been doing all the cooking, and I have not had extra time for blogging! We spent the weekend in Raleigh with family, which was the perfect medicine for feeling better. The highlight for me was definitely going to the Duke gardens for the first time. The gardens were pretty, but I mostly enjoyed running around in the mud while throwing frisbee and football. I probably should be more lady-like, but I really can’t resist the urge to get my feet muddy and show the boys what it means to “play like a girl.” Before coming home we stopped at an Asian market, and I had to buy the ingredients for one of my favorite noodle salads from the cookbook Plenty by Yotam Ottolenghi. I use the ingredients listed by Ottolenghi with the exception of sunflower oil. (When you live on a teacher’s salary, sometimes you have to make-do with vegetable oil). I definitely alter the proportions a bit. I have found that most of Ottolenghi’s recipes are too sweet for me, and the amount of each ingredient often needs adjusting. The noodles I used in the photos were not soba noodles. Last time I made this, I did use soba noodles, but I had a pack of somen noodles laying around so I used those. (If you don’t know what somen noodles are, don’t feel bad. I don’t either. They taste good though.) The brand of Asian noodles I like best is Hakubaku. They are dried, packaged noodles, but they feel fresh once cooked. We found them at Harris Teeter, so I would assume they are at Whole Foods-like stores as well. Maybe even in the Asian aisle of your regular old grocery store if you are lucky. Try them out. Every type I have bought by this brand has been a party in my mouth. 1. In a small saucepan, gently warm the vinegar, sugar, and salt for about a minute, just until the sugar dissolves. Remove from heat and add the garlic, chile, and sesame oil. Allow the mixture to cool and then add the lime zest and juice. 2. Heat the vegetable oil in a deep frying pan. 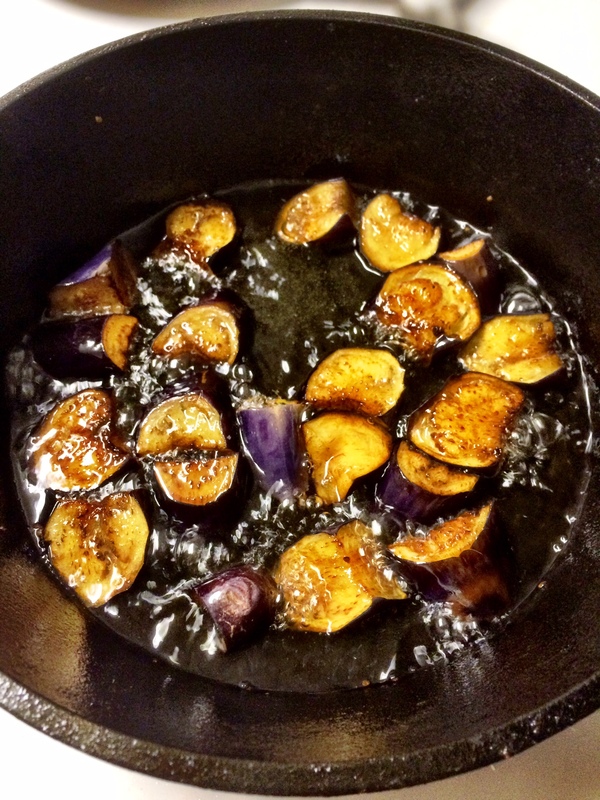 Shallow fry the eggplant in batches so that the pan is not over crowded. Once the eggplants are golden brown all around, remove to a strainer or paper towel, sprinkle with with plenty of salt, and leave to drain. 3. Cook the noodles according to the package directions. I don’t measure and time things very often in the kitchen, but I find that pasta/noodle directions generally have the cook time perfect, so timing exactly how long the noodles should cook will make a difference (mine took exactly 2 minutes according to the package). 4. Drain the noodles and rinse with cold water to stop the cooking. Leave the noodles to drain completely. 5. 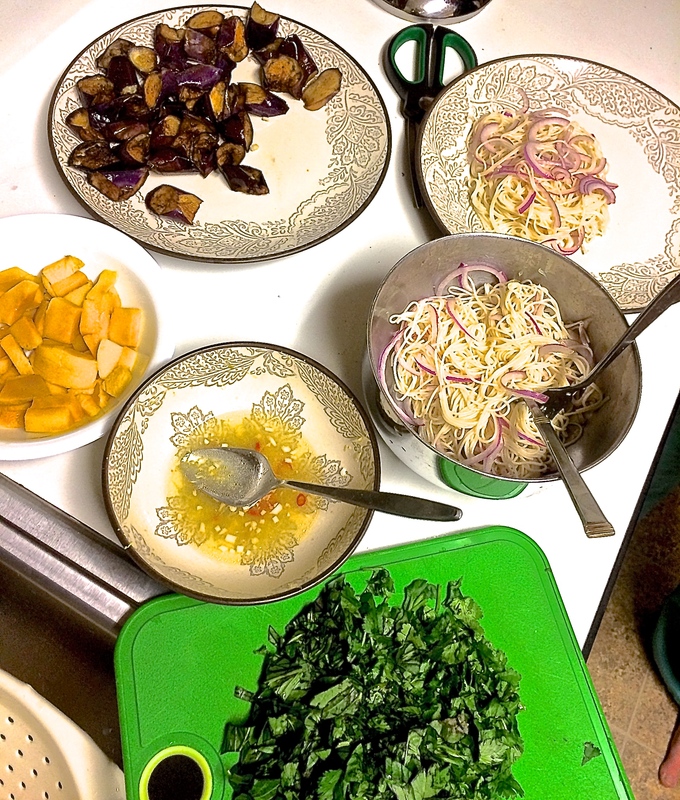 In a mixing bowl, toss the noodles with 1/2 the dressing, 1/2 the herbs, and the onion. 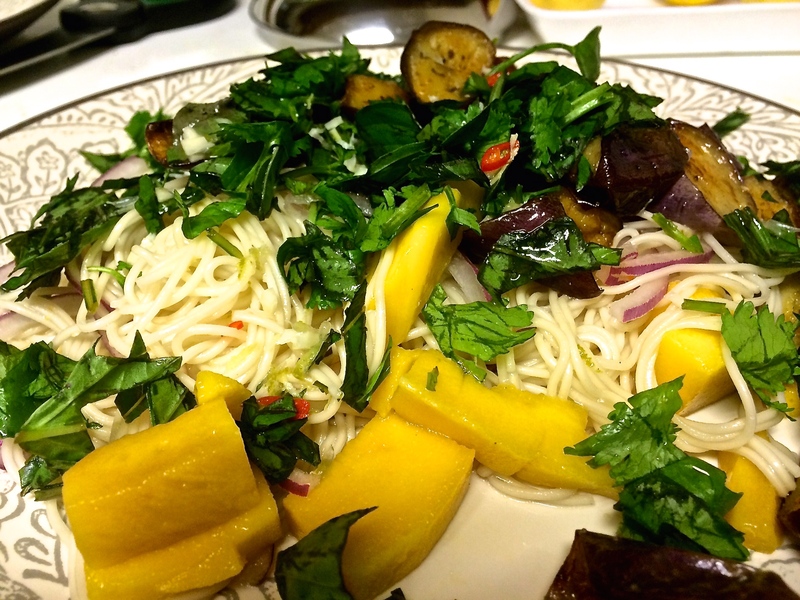 Serve the noodles on the plate and top with eggplant, mango, remaining herbs, and the remaining dressing. I top mine off with a few drops more of sesame oil and some sea salt. Great Post! I was wondering if I could use another vinegar other than rice vinegar. Thank you!